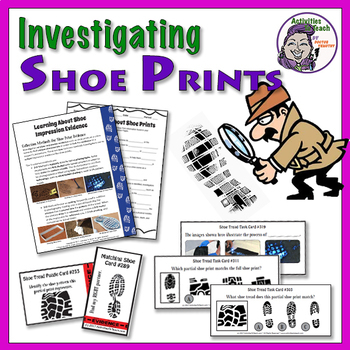 Your CSI Agents in training will love this collection of interactive hands-on learning activities exploring the concept of Impression Evidence - Shoe Treads. 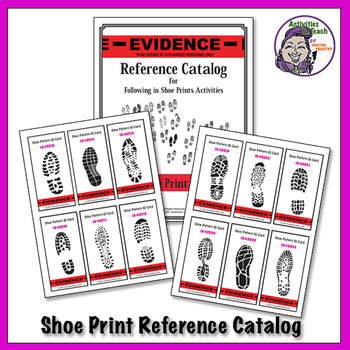 + 5 Page Shoe Print Reference Catalog with Cover showcasing 24 different shoe patterns. 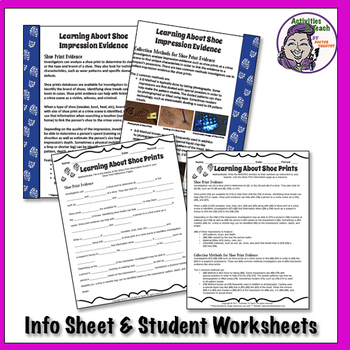 + 2 Page Guided Lesson for Students to Learn about Shoe Prints, Impression, & Collection Methods. + Answer Key for ALL versions of student answer sheets, fill-in-blank story, and ALL 120 Cards. Designed to use minimal color ink. 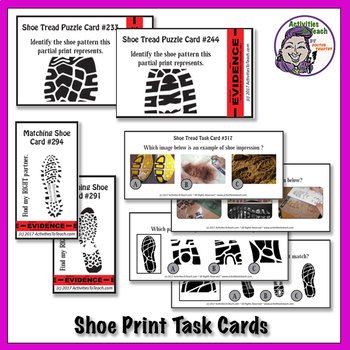 All can be printed in Black and White or Gray Scale except 12 of 24 Task Cards. These 12 tasks cards (using 4 piece of paper) can be printed Gray Scale but some details may be hard to detect. Strongly recommend printing CARDs on Card Stock and LAMINATING to ensure a long life of card. Use ziplock bags or envelopes to keep cards organized. Printing multiple sets will help support larger size classes.